Kelvin Etuhu will not take part in Bury’s clash with Barnsley on Sunday at Oakwell in Football League One. The Anglo-Nigerian misses the tie after failing to recover from a hamstring injury he picked up against Hull City in the FA Cup last weekend. The former Manchester City midfielder was substituted after only 10 minutes at Gigg Lane and he could be on the sidelines for a minimum of two weeks. 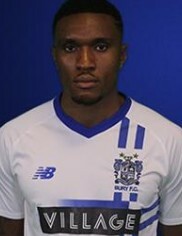 Bury manager David Flitcroft previously thought that Kelvin Etuhu would spend the next two months receiving treatment due to the stretch and type of challenge. This season, the 27-year-old has made 12 appearances in the third-tier, featuring once off the bench.